The following article was published in the Boston Globe sometime in or about September, 1892, prior to the opening of the Plymouth & Middleboro Railroad. Walking the yet open line, a Globe reporter and artist visited the proposed stations along the road. While North Carver attracted their greatest attention, Middleborough locales are noted as well, and the visit included luncheon with Albert T. Savery, chairman of the Middleborough Board of Selectmen and a director of the railroad. Well may Carver citizens feel jubilant; well may the citizens of any town that has never had a railroad hail with joy the advent of the rails of steel. Carver has changed its location as it were, and been lifted out of semi-obscurity and into the world. 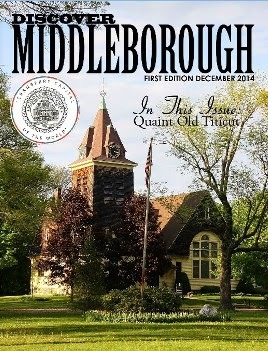 It is no longer "seven miles from nowhere," as one of its inhabitants so quaintly described it, for passing through the northern section of town is the line of steel which connects Middleboro with the sea - the Plymouth & Middleboro railroad. Probably no section of New England has ever derived greater benefit from the building of so short a railroad than will the southeastern section of Plymouth county by the completion of this line. To the west of Plymouth lies a stretch of country 50 miles in area, including Taunton, New Bedford and Fall River, and containing a population greater than the whole of Suffolk county, from which "forefathers' town" has been practically shut off; citizens of Carver have been obliged to travel seven miles to Plymouth or Middleboro to board a train, and have had to haul their freight the same distance, and East Middleboro itself was five miles from a railroad station. All these disadvantages are made non-existent by the erection of a 15-mile road straight across the country through the wooded plains of Plymouth county. 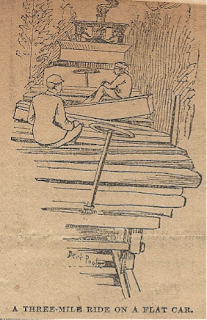 A GLOBE reporter and sketch artist made a pedestrian tour over the new road one day recently, leaving Middleboro at 9.30 and arriving in Plymouth early in the evening, being in a condition at the end of the journey to make a sworn affidavit that the road was at least 100 miles in length. But the trip was not in any way devoid of interest, though it might have been unexciting. Out from Middleboro about half a mile the road makes a graceful bend under the Everett st. bridge, and from there the rails glistened in the sunlight straight on almost as far as the eye could see. There is but one grade crossing on the line, four undergrade iron bridges, five overgrade wooden ones and one pile bridge, 180 feet long, over the Nemasket river, just out of Middleboro. There are four stations. 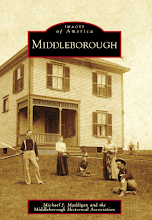 The first station is Putnam's at East Middleboro, that part of the town which is known as Middleboro Green. Here years ago the business of the town centred, but the march of empire gradually moved westward two and a half miles. Putnam's gets its name from one of the first pastors of the "old green meetinghouse," just back of which the new railroad runs. Another stretch of almost straight track for three miles more and Mt. Carmel is reached, a station on the eastern boundary of East Middleboro. We reach here shortly after 12 o'clock, and the artist, who is loaded with his sketch book and fall overcoat, suggests that we buy a dinner. So we strike the King's highway, or rather the President's turnpike, which in this instance is the "Plymouth road." "Now we'll go to the first house we see and get a dinner," says the artist assuringly. He sees the first house, but the inmates have just had dinner. We walk a half mile and the lady of the next house bolts the screen door and informs us that the men folks are all away and that she didn't cook anything today. Two or three more attempts on the part of the artist and he gives it up in disgust, but suggests after looking suspiciously at the reporter, and muttering something about somebody "looking like a tramp," that he try it. The next house we stop at the newspaper man receives the assurance, after agreeing to pay for his dinner in cash or by sawing wood, that he can have something to eat. 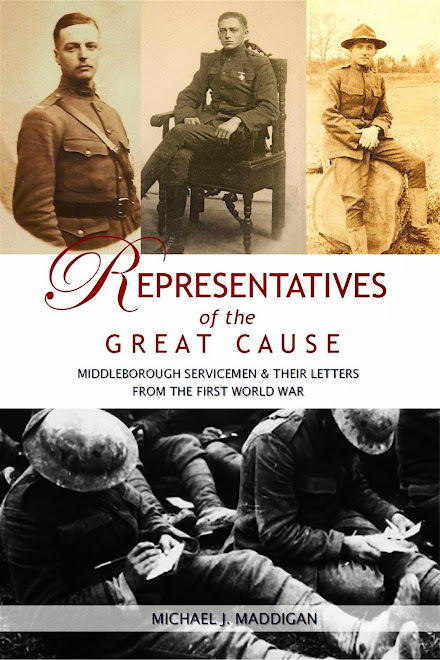 Mr. A. T. Savery is our host, and we find out later that he is a director in the new road, chairman of the board of selectmen, chairman of the board of assessors of Middleboro, ex-representative to the Great and General Court and several others. The sweet-faced young lady who pours the coffee and the tall young fellow who sits next to her at the table have just returned from a wedding trip to Washington, and this fact we don't know until long after we have left the house. Mr. Savery says the new road will increase the valuation of East Middleboro 25 per cent. North Carver station is reached at 2 o'clock. It is a small wooden structure, with a side track for freight and a freight house adjacent, situated on what is known as High st. The station is about five minutes' walk from North Carver, or "Carver Green," as it is called, and about three and one-half miles from South Carver. A railroad through the town of Carver is a novelty, but it was here that the first public meeting was held March 13, 1889, to agitate the question of a new road, and now after more than three years the originators of that movement are about to see their hopes realized. Carver has a population of about 1200, and in the vicinity of the station dwell about 400 people. 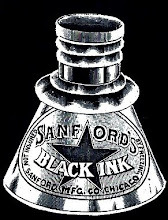 In South Carver there are one or two manufacturers, chief among these being Hon. Peleg McFarlin, recent nominee of the Democrats of that district for Congress. The nearest railroad point to South Carver is Tremont, a small station in Wareham, about five miles distant. 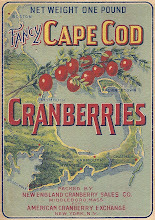 North Carver is a clean, well-kept village with a post office, a church, the oldest house in town, now occupied by Mrs. Abigail Lucas and built about 1730, a store or two and King Philip Hall, where the imported cranberry pickers are boarded. 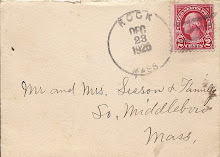 The post office is closed for a few hours while Postmaster Whitehead goes to Middleboro after a load of groceries, but when he returns he very willingly and sensibly talks about the new railroad. Mr. Whitehead is a Yorkshireman, you can tell that by his speech. The road, he says, in his broad dialect, will be of great advantage to the people living there, but he does not look for a business boom of very large proportions in Carver immediately. "By the way, who is going to be station agent?" asks the reporter. Mr. Whitehead laughs slowly and heartily. "There be mony applied for 't." he says, slowly, "but I suppose B. Ransom 'll get it. He put in his say for 't fust." While he talks the artist sketches, and it is safe to say that Mr. Whitehead will be surprised when he picks up this morning's GLOBE. There is a contest over the station agency at North Carver, that is, there is only one agency and about a dozen applicants. Mr. Savery told us that in Middleboro, and he also informed us that Mr. Fred Ward, one of carver's selectmen, wanted the position, but Mr. Wars was not at home when the reporter called, so that statement we could not verify. A call on Mr. 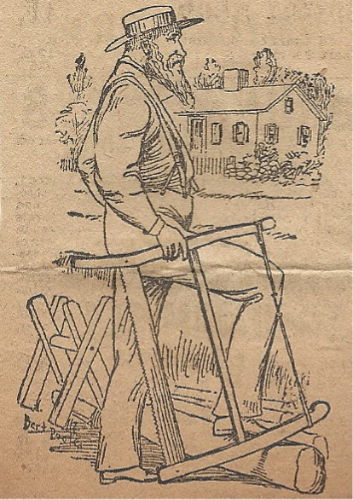 Ransom, however, "the first applicant," found him sawing wood in his barn yard. Minus coat and vest, in his shirt sleeves, a broad-brimmed straw hat on his head, he looked very much what he is, a well-to-do country farmer, satisfied with his lot and evidently thoroughly at peace with the whole world. "How do you do, Mr. Ransom? Hear your going to be station agent when the new road gets running." "I want ter know," says Mr. Ransom. "Who told ye that?" "Why the postmaster down here said you had the best chance," answered the reporter. "Did Whitehead tell ye that? Wal, I put in the first application, if that goes any way. But I hear tell that they air goin' to have a telegraph there, and if they do, of course I can't fill the bill," and Mr. Ransom laughs as if it made no difference to him whether he was station agent at North Carver or not. "Suppose this road will be a big thing for Carver?" interrogated the reporter. "Why, yes," said Mr. Ransom, "twon't make much difference for the next five years, but in 15 or 20 you'll see a big change." Somehow the conversation drifted on to politics, and from the tenor of Mr. Ransom's remarks the reporter inferred that he was a Republican. "Wal, I guess I am," said he. "So'm I," said the newspaper man. "Be ye - let's shake," and we shake a good old Harrisonian shake that would have given Chairman Harrity the blues to have seen. Mr. Ransom has carried the mail from Middleboro to carver in all kinds of weather, for 15 years, and, though he must be full threescore, looks, except for his white beard, as fresh as many a man of 40. We met another Carver citizen, not unlike Mr. Ransom. 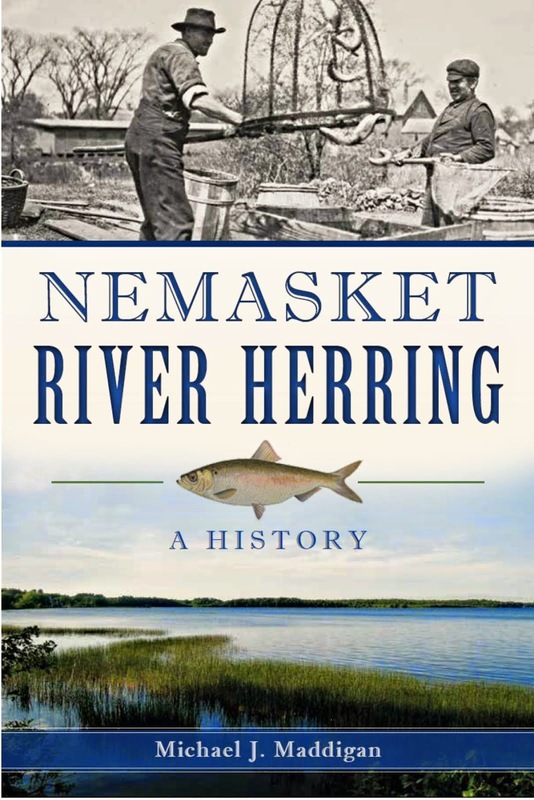 A farmer, who had long passed the allotted time, but who possessed in truth that "touch of nature that makes the whole world skin;" a type of New Englander that you wouldn't find in carver today if the railroad had been put through there 50 years ago. Long life to him. We see him less frequently as the years roll by, and we appreciate him the more. The next station on the new road is Darby, West Plymouth, and we count the ties from North carver to that point, a distance of 3½ miles through a partially wooded country, with an occasional cranberry bog by the track side. The trees are rich with the deep, dark red coloring of these early autumnal days, and the landscape presents just such a picture as fancy might paint. Darby pond is just to the east of the station, a picturesque sheet of water, and, thoroughly jaded and tired out, we rest here for a few moments. Five miles yet to Plymouth. A gravel train solves the problem, and we ride on a flat car to within a half mile of our destination. Near the terminus of the line in Plymouth a glimpse of the sea is visible, with the lights of Gurnet's twinkling like two stars on the left. The road began with the meeting in Carver in March, 1889, Dr. T. D. Shumway of Plymouth and Dr. George F. Morse of Carver being the principal instigators. Eighty thousand dollars worth of stock was issued, and the road was incorporated by a special act of the Legislature, March 20, 1890, and the location survey made in 1890-91. Of this $80,000 worth of stock Plymouth took $50,000, Middleboro $20,000, Carver $5,000 and private individuals $5,000, the whole being bonded for $225,000. It is not a venture of the Old Colony road, but will be leased by them under an operating contract for a period of 99 years, with the privilege of purchasing at any time within that period. The last rail was laid July 1, 1892, in a rainstorm and the last spike was driven by President Shumway. Since that time the contractors have been at work ballasting and surfacing the track. The road will be formally opened about Oct. 15, the Governor will be requested to attend and Senator Aldrich of Rhode Island is also expected to be present. The officers are: President, T. D. Shumway, Plymouth; vice-president, Leavitt T. Robbins, Plymouth; treasurer, jason W. Mixter, Plymouth; secretary, B. A. Hathaway, Plymouth; directors, T. D. Shumway, Leavitt T. Robbins, Nathaniel Morton, William P. Stoddard, Jason W. Mixter, Plymouth; William R. Peirce, E. P. LeBaron, A. T. Savery, Middleboro, and George F. Morse, Carver. The advantages of this road are manifest. In the first place it opens up a direct line from Plymouth to Providence. Old Roger Williams, the pioneer of Rhode Island, went direct from Plymouth to Providence, and now after so many years it seems fitting that the connecting link between the two places should be established. Heretofore when Plymouth citizens wanted to go to Providence they first rode to Boston and then to Providence, a distance of 82 miles; now, or as soon as the road is opened, they can board a train at Plymouth and ride 49 miles in a direct line, save about two hours' time and $1.50 on the round trip. Then, to go to Taunton, they first had to go to South Braintree: now the line is direct, and they save about $2.50 on the round trip. Another great advantage, will be the direct line to Fall River and New York. The distance to the first named place is narrowed down to 30 miles, where formerly it was an 80-mile ride, and a change of cars at that. A project of no little interest to South Shore people is the proposed plan of running a "boat train" direct from Boston to Plymouth on the South Shore road, and at Plymouth switching on to the Plymouth & Middleboro road, thence direct to Fall River. It is the same distance from Scituate to Plymouth as it is from Scituate to Boston, the time would be the same, and added to this there would be no changing of cars. Another great advantage the road will be to Plymouth is in the matter of freight traffic. It is estimated that three to six days will be saved in New York transportation. 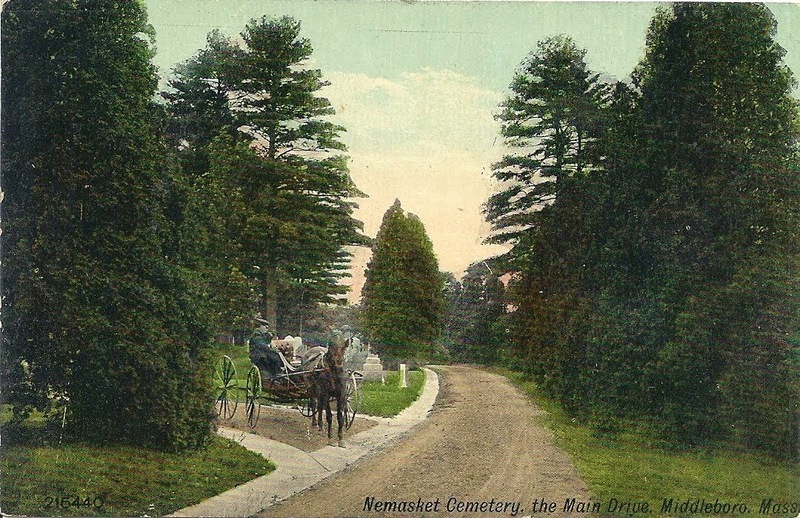 It is also proposed by the Old Colony to ship some of its New York freight by the South Shore and over the new road, thus relieving in a great measure the congested portion of the road above Braintree. Boston Globe, "Carver's Cut", c. September, 1892. 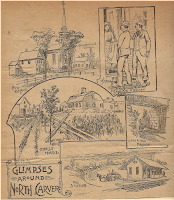 "Glimpses Around North Carver", Boston Globe, "Carver's Cut", c. September, 1892. 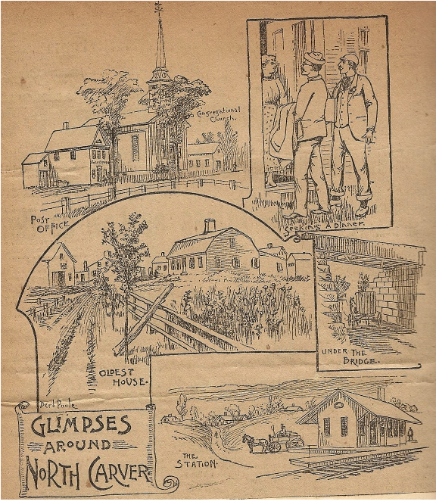 The line drawings depict the sites about North Carver as seen by the sketch artist of the Boston Globe in late 1892. Among them is an unsuccessful attempt by the artist and reporter to obtain lunch at one East Middleborough home. "A Three Mile Ride on a Flat Car", Boston Globe, "Carver's Cut", c. September, 1892. 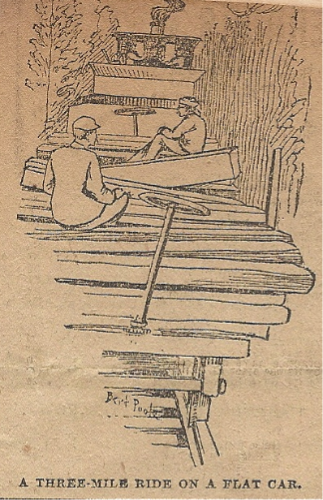 Though the two men walked the much of the Plymouth & Middleboro Railroad line between the two named towns, they did secure a ride on a flat car between Darby and Plymouth, much to the relief of their weary feet. "Postmaster of North Carver", Boston Globe, "Carver's Cut", c. September, 1892. 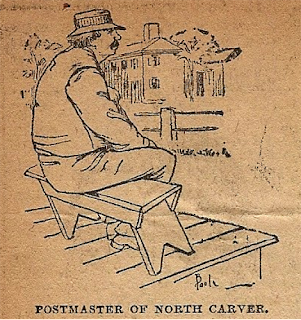 Whitehead was said to have owned the first store at North Carver, as well as serving as its postmaster. Follwing Whitehead's death, Benjamin Ransom succeeded as North Carver postmaster. 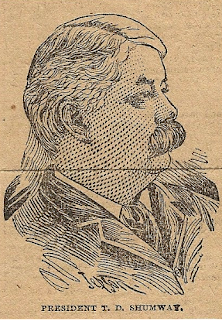 "He is Thought of for Station Agent at North Carver", Boston Globe, "Carver's Cut", c. September, 1892. Benjamin Ransom was the earliest applicant for station agent at North Carver for the Plymouth & Middleboro Railroad. His manner of speech clearly amused the pair from the Globe, and he was captured at work sawing wood by the Globe artist. 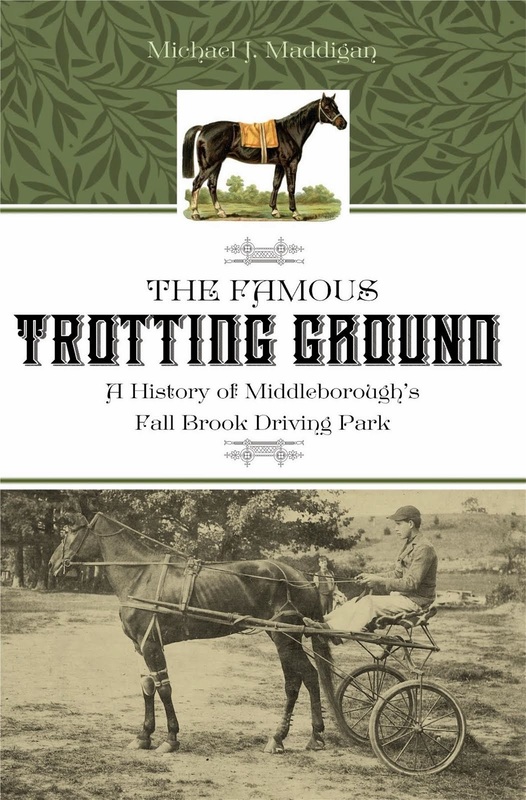 Ransom's grandson, Ellsworth C. Braddock, later left a delightful collection of stories about area entitled Memories of North Carver Village which included reminiscences of his maternal grandfather. 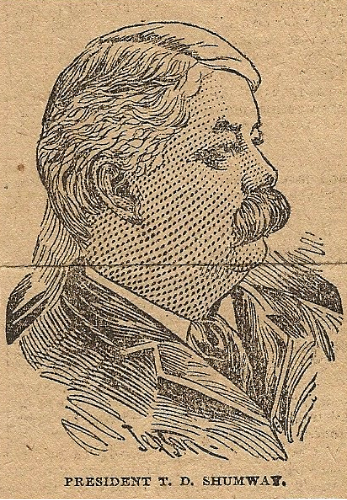 "President T. D. Shumway", Boston Globe, "Carver's Cut", c. September, 1892. Plymouth dentist Thomas D. Shumway was the leading proponent of a railroad between Plymouth and Middleborough. largely through his efforts it became a reality. Very Interesting!!!! I am going to try and bike this route someday!!! !